Take time to adjust your Timesheet Control Settings in Abtrac and make your daily data entry just that little bit simpler. The process is essentially the same in both AbtracOnLine and Abtrac 5. 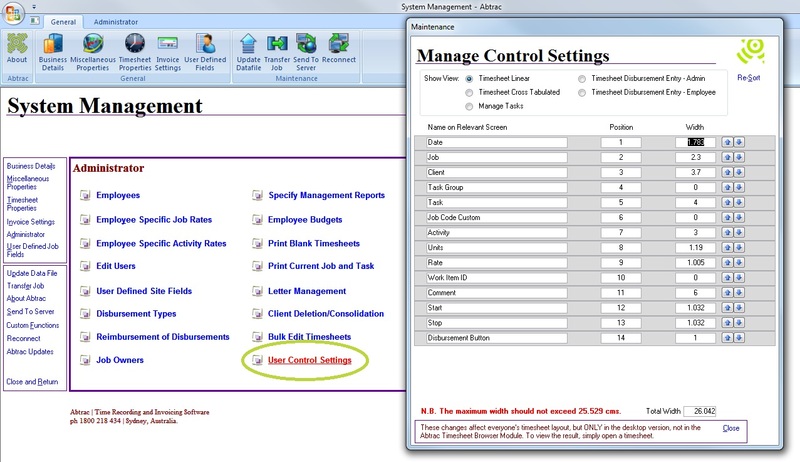 From the Administration menu choose User Control Settings and then select the timesheet layouts you wish to adjust. 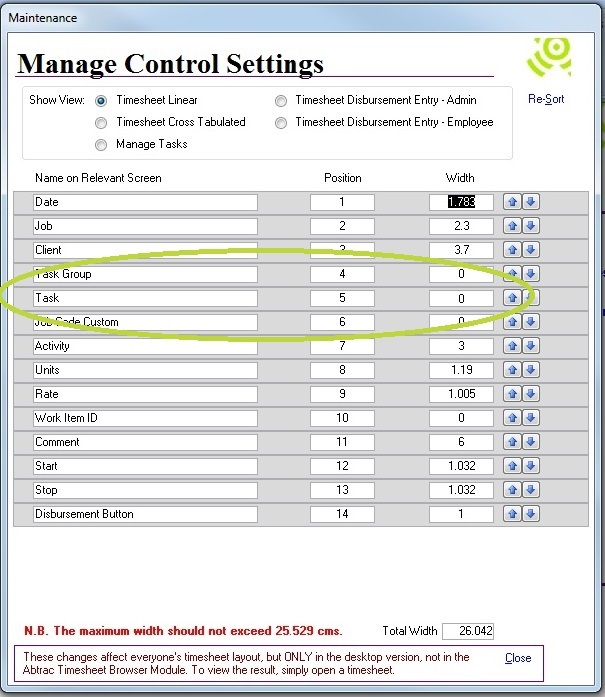 From Administration > User Control Settings you can control the column widths and fields in many of the common data entry screens. This option is only available to administrative users, and the changes made will determine the layout of pages for all users. It makes sense to tailor all the timesheet and disbursement entry screens to suit your businesses needs. You can edit the name, position and width of all the available fields. The maximum width available for each page is displayed next to your selection. If your company doesn’t use a particular field then simply set the width to equal zero to hide it. Taking some time to optimize your timesheet layouts for your requirements will save you time later on when entering your everyday data. And anything that make entering timesheets easier, makes your staff happier to enter their time, and leads to better quality timesheets. It’s a win-win. 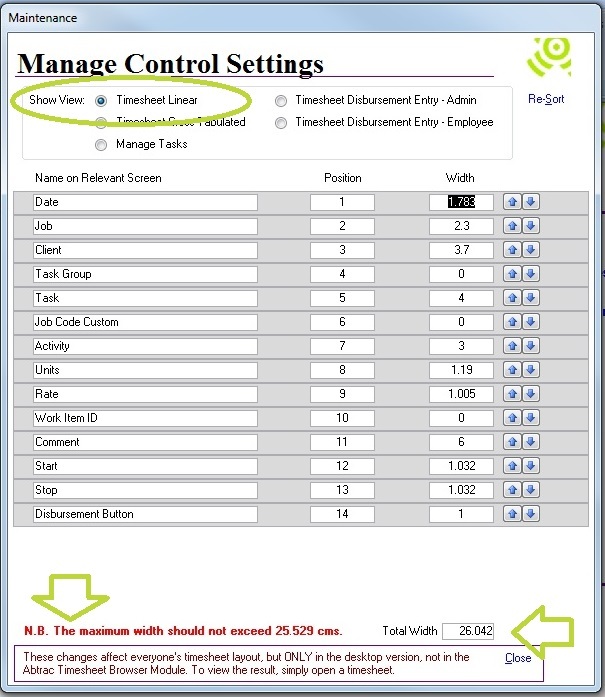 From System Management > Administrator > User Control Settings you can control the column widths and fields in many of the common data entry screens. This option is only available to administrative users, and the changes made will determine the layout of pages for all users. You can edit the name, position and width of all the available fields. The maximum width available for each selection is displayed at the bottom of the screen along with a total current width. You can review the changes you’ve made by going to the relevant page in Abtrac. This entry was posted in Administration Settings, Time & Cost, Tips & Tricks and tagged timesheet, timesheet layout, user control settings by Jen. Bookmark the permalink.